Posted on August 31, 2018 by treelawyer	tagged. 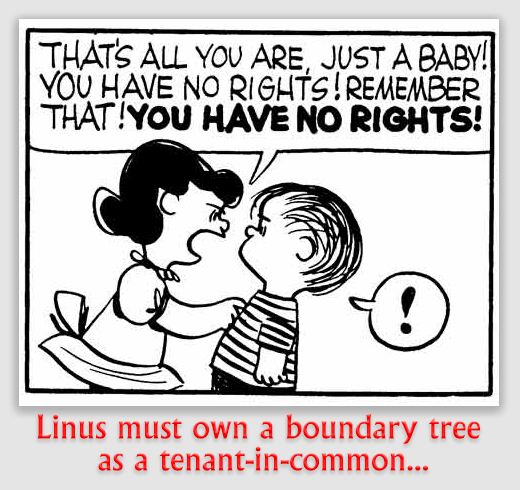 The rule regarding ownership of boundary line trees is a strange and malleable one. We often call it a tenancy in common, but it really is something different. In a tenancy in common, one of the owners can partition the property, taking a piece of it and leaving other pieces for the others. The owner can force a sale of the property. An owner of an undivided piece of the tree can’t partition the tree, cannot sell the tree, and cannot destroy the tree. In fact, under the generally-accepted boundary tree rule, neither landowner can do anything to the tree without permission of the other. Thus, a tree growing on Landowner A’s property, but with branches overhanging Landowner B’s property can have its branches trimmed, hacked and cut by Landowner B back to the property line. But the day the tree’s trunk crosses the property line, suddenly Landowner B can’t take the puniest bough with the permission of the other. 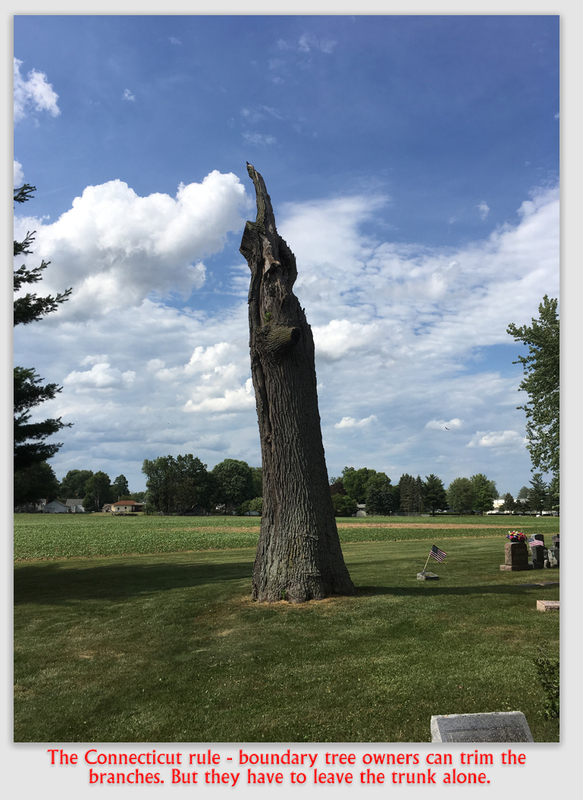 A landowner has more right to trim an encroaching tree when the trunk is entirely in someone else’s yard than she does when a part of the trunk is in her own yard. In other words, the more of the tree you own, the fewer rights you have with respect to the tree. Strangely enough, about the only place that recognizes how nonsensical that result can be is Connecticut, a state where a lot of what goes on does not make sense. 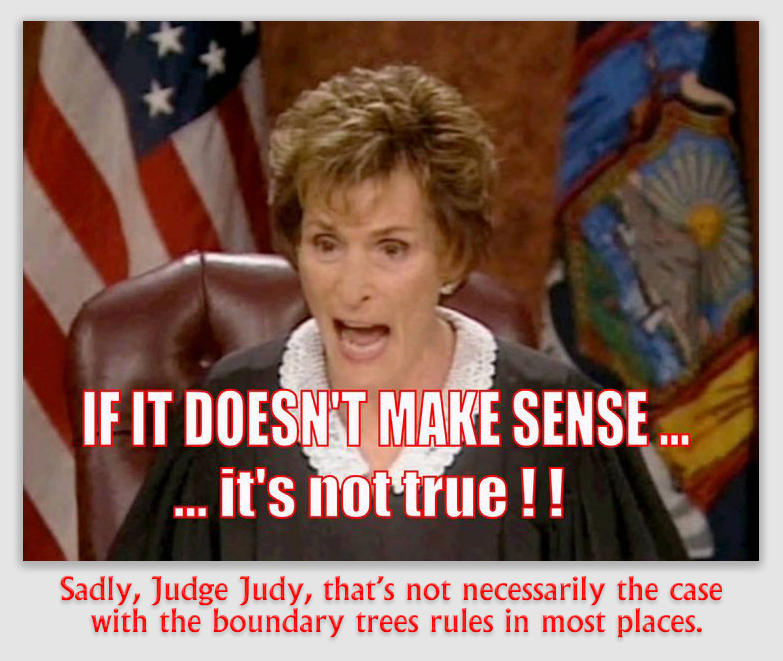 In a case that is now over 110 years old, the Connecticut Supreme Court held that where a tree is commonly owned – and the Court did not want to call it a tenancy-in-common – each owner retains Massachusetts Rule-type right to trim overhanging branches. It is only the trunk that is sacred. Robinson v. Clapp, 32 A. 94, 65 Conn. 365 (Supreme Court Connecticut, 1895). Through a convoluted chain of purchases, sales, partitions and events, the boundary line dividing two urban residential properties in turn-of-the-century New Haven, Connecticut, belonging to John Robinson and John Clapp bisected a 40-year old maple tree. The tree was valuable to Mr. Robinson as a shade tree and ornament, and shaded a part of his premises. Mr. Clapp intended to build a house to extend down along the boundary line for a distance of 58 feet from a point about 6 feet from said Bradley street, which would require removing the part of the maple tree in his yard. The proposed tree cutting would kill the tree. At the time of both men bought their respective properties, there was no fence or other visible sign of demarcation marking the boundary line. However, Mr. Clapp had previously lived within 100 feet of the premises, and was fully acquainted with the boundaries. Held: Mr. Clapp could be enjoined from cutting any of the trunk, but he was free to trim all limbs that overhung his property. The Court held that trees which stand wholly within the boundary line of one’s land belong to him, although their roots and branches may extend into the adjacent owner’s land. However, the adjacent owner may lop off the branches or roots of such trees up to the line of his land. Rather, the Court concluded that each of the landowners upon whose land any part of a trunk of a tree stands has an interest in that tree equal to the part of the tree which is upon his land. Each owner the right to demand that the owner of the other portion use his part as not unreasonably to injure or destroy the whole.